Impatient with PCOS: Guess who I met today! You all might not believe it, but I met the MOST fertile woman E.V.E.R. I know, what are the odds? It was really hot out today so I took Michael to the mall to play this afternoon. A mom walked in with four little ones and sat down near me. We talked a little and then she made a comment about her stomach hurting because she was pregnant (she looked like a size 2, fyi). MFWE: Yeah, I was going in to get my tubes tied and they asked me if I felt pregnant lately. MFWE: Yeah, I asked them if they could go ahead and tie my tubes anyhow. They said no. Me and my husband have always been careful, but I just keep getting pregnant. I've gotten pregnant on the pill, using condoms, with norplant, with an IUD, and I found out I was pregnant last time when I was supposed to get a hysterectomy because of a bad car accident. But I couldn't get the hysterectomy because I was pregnant. Me: Have you heard of the Essure process where they insert little springs to block the tubes? MFWE: Oh yeah, I got pregnant with that too. Me: Maybe you should try for that hysterectomy again because with your luck your tubes will grow back and you'll get pregnant again. She apparently has 5 children but has been pregnant 8 times (I didn't ask what happened to the other three). I told her that I was the opposite and it took months and several thousand dollars to get me pregnant. I told her that I took a picture of Michael with his bill on the anniversary of his conception. She thought that was pretty cool. I'm not sure if she was a huge liar or if I should have asked her to sign my ovaries. I have a feeling that she wasn't lying but might have been a little mistaken... perhaps she thought the Essure implants were the same as an IUD? I can't imagine that someone one would get pregnant after having those springs inserted for a few months and then get pregnant at least once more (her current pregnancy). And if you had those you wouldn't need a tubal ligation. But she was trying to show me her norplant scars. She said comes from a family of 9 so I bet she inherited good fertility. And as a bonus she said her youngest was walking at 5 months. The is absolutely the earliest I've ever heard of a kid walking, but she also pointed out that he walked funny and that they were having him checked for spine curvature and other issues since he may have actually over stressed his growing bones walking that young and caused problems. I'm learly of believing with such extreme stories. I've known way too many pathological liars and this seems like it wreaked of deceit, except that it DIDN'T.She might have been a little confused, but I really think I met the most fertile woman ever. I seriously should have taken a picture of her. I have to say, I am super happy that you met her NOW and not say two and a half years ago. Wow. 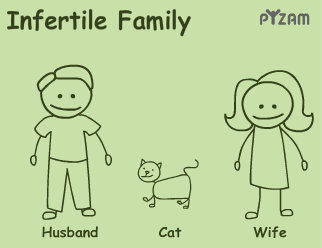 What would it be like to be that fertile? Though taking on that many children blessing or not, would have me drinking my breakfast. I would have peed my pants if you got her autograph. Sounds a bit fishy to me. Although I do have a friend who got pregnant twice while on BC. BTW you totally inspired me with your shirt making and I've started to set aside old/stained shirts to make GV some. I met a woman like that once at the mall. She had 3 babies and a bump and the oldest was just 4. She looked rather tired. I just read your comment on my blog and would love your old supply of domperidone (and am of course happy to pay for it, or at the very least shipping) but I can't find your e-mail online. Will you e-mail me: longdistanceinfertility (at) gmail. Thanks!